How do top students play and study? Is it possible to excel academically and still have a social life? If these are questions you want answers to, here’s my take. In high school, for whatever reason, I decided I didn’t like most Ivy League schools because all the representatives from them that I met seemed all work and no play. I’m sure that wasn’t entirely accurate, but nonetheless was mortally afraid of going to school in an antisocial environment. When I visited Stanford, I thought I saw a glimmer of social engagement– and that’s the school where I ended up. I eventually learned, however, that inevitably most top students probably study more than play. Whether it’s at Harvard or Stanford, or even a top high school, people are working hard. That being said, you can aim for some semblance of balance. If anything I’ve probably struggled more to “play” than to “study” — there are plenty of others (or many more others) whose situation is flipped. Part of figuring out that balance is to know what matters to you most, and living out that value system while knowing your “default” mode you need to guard against. Once you figure out your own bias, you know which activity (work or fun) you need to work harder to incorporate in your life. Overall, there are a few ingredients that I’ve found to be crucial to maintaining that balance. As a high school student I had a ridiculous amount of energy– I could stay up studying until midnight and wake up at 6am — only to recover by sleeping until noon on the weekend. As a college student, when finals or deadlines called, I would skimp on sleep, and pull an all nighter. As an adult, I can no longer make these trade offs, but while it lasted, giving up sleep proved a means of “having it all” (almost). In both high school and college, I applied the same logic to my social life– sleep comes second. If I had finished a final or big exam, or even completed our last theater show of the season, I would take a night or two and stay out until 3-4am — the fun was extended and intense. Likewise, sometimes I would ditch my homework to say yes to a social invitation– and then would be studying until 3-4am to make up for it. We’ve all read articles about CEO’s sleeping 4-5 hours a night– and while those stories may be anecdotal, Time Magazine reports that the average for a C-level executive is 6.7 hours– less than most of their employees. I would imagine that intelligent and social students exhibit similar patterns. If you’re an achiever type, you’ll put in all you have. If you’re an achiever type that also has a desire to be social, something’s gotta give, and for me it was sleep. That being said, losing sleep can have unfortunate consequences–emotional instability, increased likelihood of getting sick. At a certain point you can’t do everything. But you can figure out what your limits and priorities are and adjust accordingly. Most high achievers are in some sense achievers by nature– either it’s their personality or their passion. I was the kid whose parents were trying to get to study less, loosen up more, and hang out with her friends more. Many kids hate studying– it’s potentially easier to convince an achiever to have some fun, than convincing a person who hates studying to pick up his textbooks. I think we all have a need for social engagement, and I certainly value my relationships above my achievements, but my nature is to work and achieve. If left to my own devices, without pushing myself to be social, I would work a lot. I think many top achievers are similar– their “default” is to study or work first not socialize. From attending Stanford, and observing the other students there, I found this to be particularly true. In terms of intensely social personalities, I can think of only a handful of students I knew there– but even those were very engaged, intense people– they were passionate and “go go go” all the time. Even so– they still were achievers, too. They existed, but weren’t the norm. In fact, I personally felt I had to reinvent myself as a “social” person because there were so fewer socially oriented students at Stanford than at my high school. I certainly found fantastic friends there– but the level of dedication to “having fun” was far less there than my experience in more “normal” environments, where I could be social on the coattails of my connector friends. At Stanford I had to make more concerted efforts. A story I often tell is that one time, a week or two before finals, I felt stir crazy and needed a break. It was a Saturday afternoon — and I started knocking on doors, sending emails, and calling to find a friend who would hang out that evening. I asked twenty two people until I found someone who would come out and be social for an hour or two. I would imagine on a more social campus finding someone to attend a house party or grab a coffee with in your dorm wouldn’t take so much effort– even a few weeks before exams. In fact, from visiting friends at a state university, and attending another university for graduate work, I know it. From the story above, you can see that if you’re in a top achieving peer environment, you may need to make serious efforts to protect your “play” time. Even without that environment, your own nature likely pulls you more in one direction than another– towards study or play. Whatever that direction is, your job is to make efforts to find the balance you desire. Now as an adult, I’ve made new years resolutions in the past to put social events on my calendar each week so that I continue to push toward the balance I want to achieve. Even meeting my husband was something of a goal oriented effort– setting aside hours each night for an intense two weeks to parse through thousands of online profiles (it worked!). Making friends takes work, too. Planning is often your best defense. That goes for the reverse, too– if you play too often, put studying on the calendar. Make it a priority. Much of this reiterates some of the advice I give in the blog and video, 5 Secrets of Straight A Students. I also managed my classes without doing all the work– instead I would pick and choose what were the highest yield activities. In preparation for a discussion section for a humanities class, for example, I might read deeply about 50 pages of the reading (and not the first 50! Everyone reads the first 50! )– that would be the section I would really talk about aloud in class. I would skim the other 250 pages– enough to say a few things and keep up with the discussion, but perhaps not enough to pontificate. Large lecture classes that didn’t take roll I would occasionally skip in order to have enough time to complete essays or other assignments, particularly if I knew the professor taught straight from the book, or uploaded lectures online. In grad school, when I had a boring critical studies course, I would shoot off production emails in the back while listening to the lecture– absorbing the information but using the in between moments to get work done. In high school I read Cliff Notes (don’t tell my English teacher) if I didn’t have time for the book. These are not typically the kinds of activities I would brag about, but they’re the way I survived, kept my grades intact, and managed a social life. I also developed other systems for efficiency. Vocabulary I always studied with flashcards– that way I could sort out words I knew and not waste time looking over content I’d already studied. I used mnemonics for memorization. (I have a video on those here: Mnemonics: The Best Way to Learn Vocabulary). I’ve used audio books as a way to multitask– I can read and drive or work out at the same time. In high school I used to do a small amount of work in passing periods before other students arrived in the classroom– or while waiting for the rest of my track team to show up in the locker room. A lot of people work hard. High achieving social people work strategically. None of us are perfect, and we all struggle to find balance. No one can be the most social person on the planet, and the highest academic achiever. It’s up to you to know yourself and find that balance in your life – the balance that maximizes your personal potential and values. 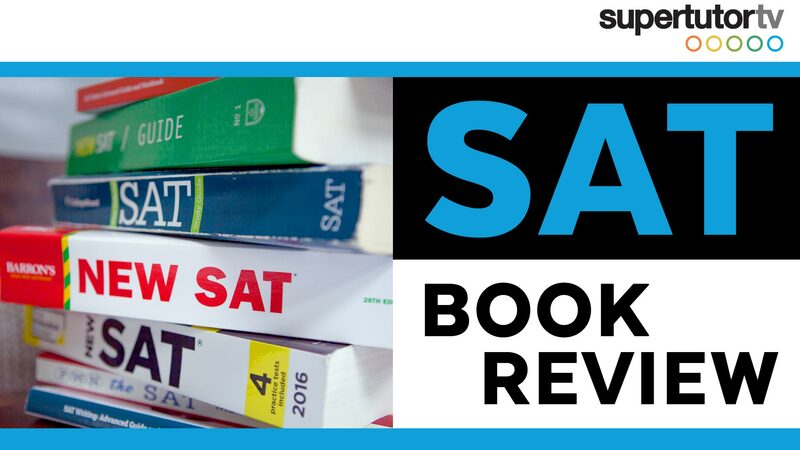 Looking for the best books to prep for the SAT? In this video I walk through some of the different books out there - and go through what materials I use with my students.